Great competition given to other Chinese brands xiaomi or Kodak, cloud walker, TCL. Making running for the money. It is not budget TV, it is truly premium TV in budget price. At 40 K plus A+ LED panel. 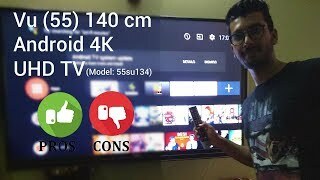 Picture quality at par with best brands sony, lg. Connectivity options are more than top brands and most of operational. Cherry on top running on official Android 8 TV Operating system. VU is launching really with great game plan to disturb the TV market. It is possiblility of emerge as best brand in near future. VERY STURDY & NICE PRODUCT. WORTH THE PRICE. AMAZING QUALITY AT AN AFFORDABLE PRICE. TV BUILD VERY STRONG. I AM HAPPY WITH THIS PURCHASE. TV INSTALLED 3 DAYS AGO.BUT YOU NEED VERY HIGH SPEED DATA CONNECTION TO UPDATE THE APPLICATIONS OR INSTALL THE NEW APPLICATIONS. I CPULD NOT UPDATE THE APPLICATIONS OR LOAD NEW APPLICATIONS WITH EVEN MY 1 MBPS DATA SPEED. THE SERVICE GUY TOLD ME, I NEED AT LEAST 5 MBPS SPEED TO UPDATE OR LOAD ANDROID APPLICATIONS.TV INSTALLATION GUY WAS A PROFESSIONAL PERSON. WELL BEHAVED. INSTALLATION ON WALL DONE IN 1 HOUR MAX. 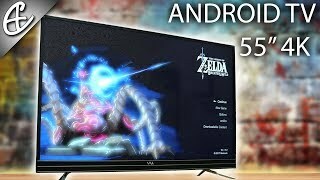 BUY THIS TV WITHOUT A SECOND THOUGHT. CONSIDER 43 OR 50 INCH FOR 1000 SQ FT FLATS. FOR LARGER LIVING ROOMS, 55 INCH IS GOOD. (MUST MENTION, VU OFFICE CALLED 2-3 TIMES FOR INSTALLATION EVEN BEFORE TV WAS DELIVERED. A GOOD SIGN. THEY ALSO CALLED AFTER THE INSTALLATION. A SERVICE GUY IMMEDIATELY ATTENDED MY CALL REGARDING UPDATE QUERY OF APPLICATIONS. SERVICE SUPPORT SEEMS GOOD.TV IS RESPONSIVE, QUICK BOOTING. (THE HOME BUTTON ON REMOTE COULD HAVE BEEN BETTER PLACED. WHILE PRESSING SCROLL DOWN KEY, IT ACCIDENTALLY GETS PRESSED.BUT WITH REPEATED USE, ONE WILL GET USED TO IT. NOT A BIG ISSUE. BUT IN FUTURE REMOTES, PLEASE ADD A SPACE IN BETEEN THE SCROLL DOWN BUTTON & HOME BUTTON).THANK YOU AMAZON & VU FOR A OVERALL GOOD EXPERIENCE UNTIL NOW.